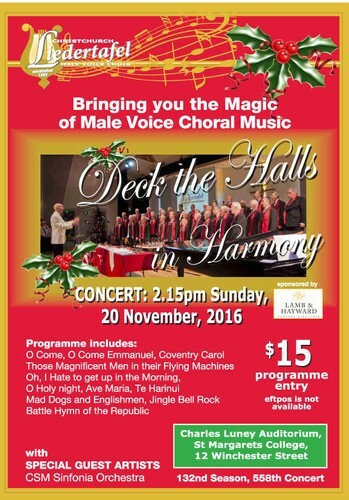 The Liedertafel Male Voice Choir: Christchurch's premier male voice choir, bringing you the magic of male voice choral music! Presenting: "Deck the Halls In Harmony"
A programme of seasons favorites and much loved songs from throughout the ages! Accompanied by special guest artists: Christchurch School of Music Sinfonia.